With no signs or symptoms, Sheila had no idea she was waking up daily with a growing mass of abnormal cells in her breast. As she routinely reported to work each day, the tumor continued to do its own work. Fortunately, Sheila faithfully scheduled her yearly screening mammogram. 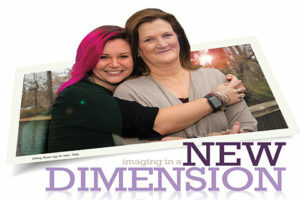 Sheila knew routine screenings were important because what she could not see growing inside of her body, the radiologists and radiation techs at the CHRISTUS St. Michael Imaging Center could. For patients like Sheila, we are committed to continue to provide the latest in breast imaging technology to our community. While we currently have two 3D Tomo units, we are actively working toward purchasing a new high definition (HD) 3D Tomosynthesis Unit for breast screening exams as well as an upgrade to our two existing 3D Tomo Units with HD and a new 3D Breast Biopsy System to assure we continue to provide the latest in breast imaging technology. Three-dimensional tomosynthesis mammography detects 41 percent more invasive breast cancers, detects cancer 15 months earlier and reduces false-positive recalls by up to 40 percent as compared to the conventional 2D mammography.